Pagoda is a simple game to learn. The only real wild card is the special powers that someone will have to understand. The special powers allow you to break the rules and to get an advantage. At its heart, Pagoda is about matching the color cards to accomplish the build that you want to build. You can easily see the majority of cards your opponent has and you can attempt to block what they want to build. 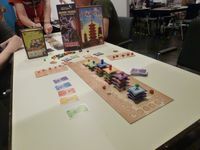 Pagoda is not a game you will want to play all the time and it will not main event a game night. Rather, it will be a nice starter game or something you will play while you are waiting. While the game has a theme, it is really an abstract about card matching. The game looks really nice when it is built and you are done. The Pagodas you build are three dimensional and are very colorful. It is a pretty game. The game gives you some decisions about when to build and timing that bid, but with out perfect knowledge of what your opponent has they can always surprise you. Also, you are limited by the cards you have an other than waiting to do what you want, you have little control to mitigate your card draw. It is a game you can talk about other things while you play. I wouldn't try and turn this into a brain burner. It is a light abstract that most will be able to play (if they can grasp the special abilities). Is this a great game? Nope, not even close. Yet, many will like it and it can pass the time. The components are top notch. The little board you use folds up nicely and that is a huge plus to getting a small box. The wooden bits are nice and colorful. The tiles are matched up color wise very well. The cards are great and they do not need to be shuffled much. The bits are top notch and work great within the confines of the game. For an abstract, I love the color and the look when the Pagoda's are built. The rule book is a professional book. It is full color and has plenty of pictures. The rules are fantastic to learn the game and I had zero issues after I read the book once. I rarely, if ever, referred to the rule book again. The rules are really simple, only the special abilities will need any reference. We had to remind ourselves about the special abilities and a player aid would have been very helpful. The flow of the game is really simple. You are trying to score the most amount of points by helping build the Pagoda's for the mother country of China. Basically, each player will have 5 face up cards in front of him of which he can use to build. He will also have 2 hidden cards in his hand (hidden from the other player). So the other players have some information on what you can do, but lack all the information. Pagoda's are built using the simple rule the columns must match the colors on the tile. This is simple to understand with a picture or the rule book. So, on your turn you try to score points by building columns, roofs, and tiles by playing cards that match the color that you want to build. You want to be the one to build the tiles/floors because they give you special abilities that give you an advantage. You are limited by the cards you have to play and the colors that you have. This is one of those bland games that I could take or leave. 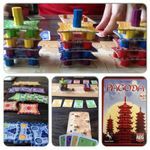 I have fun while playing it, but I can't see myself getting excited about a big game night centered around Pagoda. I am sure you will feel the same way. Instead, I feel this is one of those games you might play while you are waiting on a few other guys to show up or if you want to fill about 15-20 minutes. Or you just want to get it played. Ok, I guess what I am getting at is this is something you will play with your grandma or your wife. It has a few interesting decisions, but it is really an abstract game that doesn't make you think too much. Not bad, not great. Somewhere in the middle depending on your taste. Keeper. For now. Till I bore of it. Ok, I guess what I am getting at is this is something you will play with your grandma or your wife. It has a few interesting decisions, but it is really an abstract game that doesn't make you think too much. As a wife, and hopefully one day a grandma, ouch! Why not just write 'something you will play with a non-gamer'? When my mum was a mum, she played Heroquest and Battlemasters with her little daughter. Or typical grandma or wife. In my experience, my wife tends to play non-combat games. Games with high player interaction or direct conflict she shies away from. I also game with a woman who likes direct conflict games. I realize generalizations won't work for every person on the property. I didn't mean any insult, but generalizations help when quickly describing a situation. I don't necessarily think this is the best gateway game. While a game a new gamer could play, I don't think it will draw someone into the hobby. Can we all at least agree that not only am I jerk but wives who play these games are not the norm? It would be nice not to see attitudes which discouraged them.